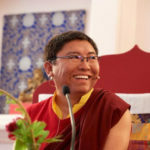 An extraordinary aspect of Tsoknyi Rinpoche’s life and work is the spiritual and material support he provides for a large number of nuns in Tibet and in Nepal. Hundreds of nuns study and practice in his hermitages in Nepal, and in the Nangchen region of East Tibet around 2,000 nuns and 900 monks are under his care. 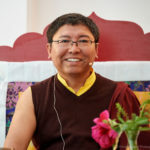 He carries on a legacy started by Tsoknyi Rinpoche I in the mid-1800s, which was to create a vibrant system of practice centers and hermitages with extremely rigorous standards of practice that would allow thousands of women to strive for the fruit of Tibetan Buddhist practices: great love and compassion and profound freedom. 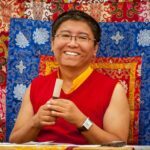 This system was renowned in Tibet for the commitment and deep realization of its practitioners, with many great masters attesting to their excellence. The nuns live hard and simple lives, mirroring ancient Buddhist sages like Milarepa, and yet have a palpable, infectious inner joy and radiance. After the revolutionary changes in the 1960s and 70s in China and Tibet (resulting in the loss of all of the existing monasteries), a few of the older nuns maintained their practices in caves and endured great hardship surviving in the high mountains in the Nangchen region. Through their immense love and care for the tradition, once conditions were ripe, they began to rebuild the practice centers and hermitages from scratch and teaching a new generation of nuns. Hearing that their lineage master was again active and teaching, a small group of these nuns walked all the way from Nangchen to Nepal seeking out Tsoknyi Rinpoche. The living presence of a master is considered a great blessing, as the master embodies the warmth and integrity of the teachings and imparts the transmissions of the lineage.